Well I've found this on Pinterest on 3rd September 2014 but didn't have time to blog about this until now, sorry. 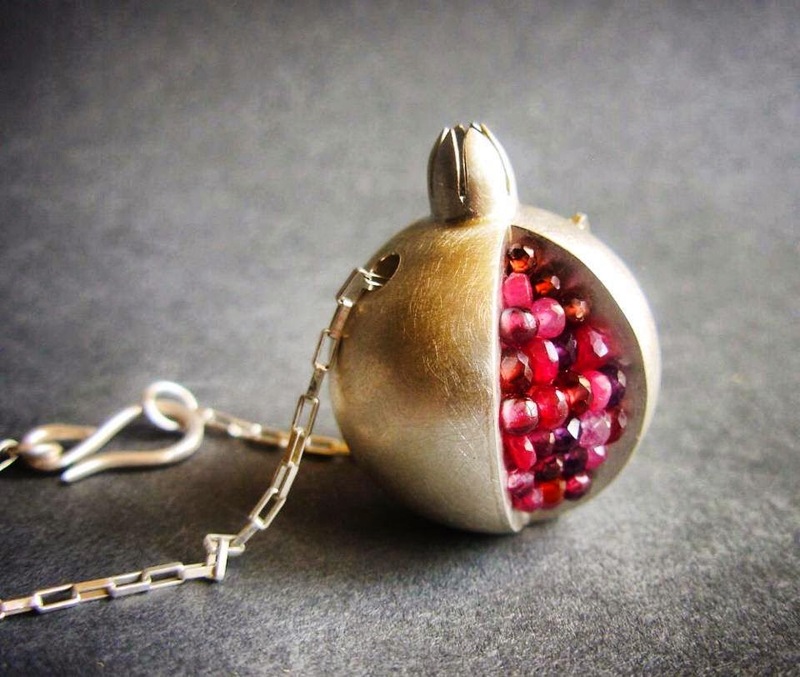 This beautiful Pomegranate Pendant is made in matte silver, with rich, warm pinks, reds, red-orange and purple faceted gemstone-beads. A sensuous form with strong metaphorical allusions. This 3-dimensional hollow round form sculptural pomegranate is 100% hand constructed - raised, soldered and surface finished in sterling silver. The pendant is beaded with faceted and smooth ruby, pink sapphire, amethyst, tourmaline, rhodolite garnet and red garnet beads. This is the largest of Boline's OOAK spheric pomegranate pendants; it measures approximately 25mm wide (diameter of sphere) and 30 mm high. The pendant glides on a sterling silver 2.1 mm rolo chain of about 30 inches long with a hand made infinity clasp.